A blog about our project to explore, test and enable practical preservation of born digital records. For this post, I just want to look at how emails are rendered as Xena transformations. I should stress that Xena doesn’t expect you to normalise individual .msg files, as we have done, but instead convert entire Outlook PST files using the readpst plugin. Nevertheless we still got some useable results with the 23 message files in our test corpus, by running the standard normalisation action. In our test corpus, the emails generally worked well. Almost all of them had an image file attached to the message – a way of the writer identifying their parent organisation. Two test emails had attachments (one a PDF, one a spreadsheet). Four of them contained a copy of an e-Newsletter, content which for some reason we can’t open in the Xena viewer. I’ll want to revisit that, and also try out some other emails with different attachment types. 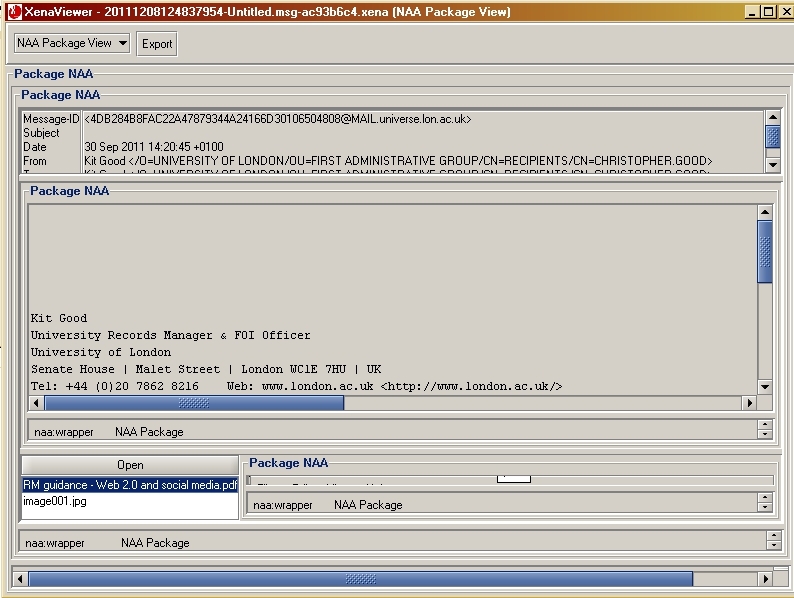 The text of the email message in the large Package NAA window. Below, a window displaying the technical metadata about the rendition. Below the large window on the left, a small window which is like a mini-viewer for all attachments. To the right of this window is technical metadata about each attachment. Right at the bottom, a window showing the technical metadata about the entire package. Even from this view, it’s clear that Xena is managing an email as separate objects, each with their own small wrapper, within a larger wrapper. The immediate problem we found here was truncation of the message in the large window. This is being caused by a character rendering issue, and the content isn’t actually lost, as we’ll see when we look at another view. 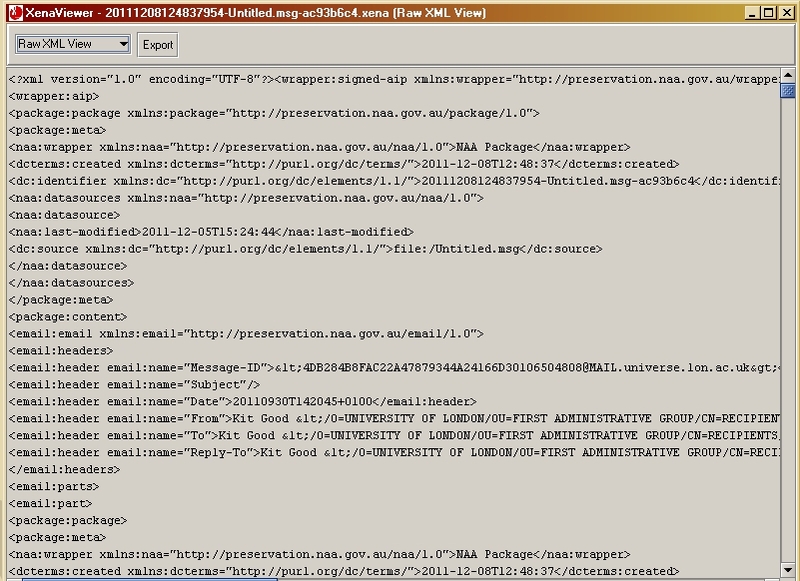 In the Raw XML view (above image), we can see the XML namespaces being used for preservation of metadata from the email header (http://preservation.naa.gov.au/email/1.0) and a plaintext namespace (http://preservation.naa.gov.au/plaintext/1.0) for the email text. If we copy the email text from here into a Notepad file, we can see the problem causing the truncation. Something in the system doesn’t like inverted commas. The tag plaintext:bad_char xml:space=”preserve” tells us something is wrong. 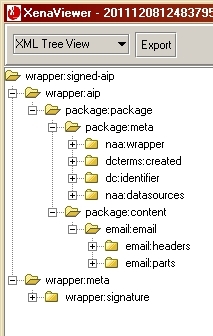 In the XML Tree View (image below) we can also see the email being managed as a Header and Parts. Puts the message into XML. It can now open in a browser and appears reasonably well formatted. 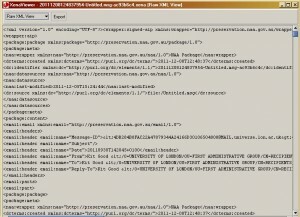 When opened in a browser, the XML message file also contains hyperlinks to its own attachments, which has some potential use for records management purposes (provided these links can be managed and maintained properly). So far so good. Unfortunately this XML rendition still has the bad_char problem! It would be possible to open this XML file in UltraEdit and do a find and replace action, but editing a file like this undermines the authenticity of the record, and completely goes against the grain for records managers and archivists. The second option we have for .msg files is to normalise them using Xena’s Binary Normalisation method instead. This creates something that can’t be read at all in the Xena Viewer, but when exported, this binary object converts back into an exact original copy of the email in .msg format, with no truncation or other rendering problems. Attachments are intact too. It creates the same technical metadata, as expected. PRO1 – no truncation of the message. PRO2 – lots of useable metadata. CON1 – file names of the XML renditions are not meaningful. Each email becomes a numbered item in an mbox folder. CON2 – attachments simply don’t work in this process. This entry was posted in project progress and tagged emails, metadata on January 20, 2012 by Ed Pinsent.